The diversity of naive CD4 T cells plays an important role in the adaptive immune response by ensuring the capability of responding to novel pathogens. In the past, it has been generally accepted that naive CD4 T cells are intrinsically long-lived; however, there have been studies suggesting some CD4 T cells are short-lived. In this report, we identify two populations of naive CD4 T cells: a long-lived population as well as a short-lived population. In addition, we identify two factors that contribute to the establishment of long-lived naive CD4 T cells. We confirm earlier findings that MHC class II interaction with the TCR on CD4 T cells is important for survival. Furthermore, we find that MHC class II alleles with the correct restriction element for Ag presentation mediate the peripheral survival of naive CD4 T cells more efficiently than other positively selecting alleles, regardless of the selecting MHC in the thymus. The second component contributing to the survival of naive CD4 T cells is contact with the cytokines IL-4 and IL-7. We find that the physiological levels of IL-4 and IL-7 serve to enhance the MHC class II-mediated survival of naive CD4 T cells in vivo. Tcells are selected in the thymus and released as mature naive T cells into the periphery. However, the thymus shrinks with age, and, as a consequence, there is a reduced output of new T cells. As such, the maintenance of the existing mature T cell pool becomes an important issue. This problem is resolved in part by the generation of long-lived naive T cells, which ensures the opportunity to form immune responses to new pathogens throughout life. There is much evidence that resting naive CD4 and CD8 T cells persist and remain in interphase for long periods of time (1, 2, 3, 4). Yet, previous studies have indicated that the percentage of naive CD4 T cells is reduced following thymectomy (5), suggesting that not all naive CD4 T cells may be long-lived. This finding raises the issue of whether all T cells emerging from the thymus have an equal potential for long life, and, if so, whether there are factors that promote longevity in some T cells while other naive T cells are lost. Emerging evidence suggests that interaction with MHC molecules plays an active role in mediating the survival of naive as well as memory T cells. Recent studies have shown that neither CD4 nor CD8 T cells survive in an environment that is devoid of MHC expression (6, 7, 8, 9), and that the survival of CD4 T cells can be mediated by MHC class II expression on dendritic cells alone (7). Moreover, it has been shown for both CD4 and CD8 T cells that survival is specifically mediated by the MHC alleles upon which T cells are selected in the thymus, and that MHC alleles that are incapable of selecting a given T cell are also incapable of delivering peripheral survival signals to that T cell (9, 10). However, some T cell specificities can be selected by more than one MHC allele (11), and it remains unclear whether a T cell requires the same MHC molecule for survival in the periphery that mediates positive selection in the thymus or whether a T cell can be maintained in the periphery by a different selecting MHC molecule. Although signals delivered by MHC molecules to T cells appear to be necessary for peripheral survival, there is the possibility that additional factors may contribute to this process as well. In vitro studies have shown that cytokines can rescue T cells from apoptosis in tissue culture. In one report, resting T cells were shown to undergo apoptosis when taken from mice and placed into culture, but this death could be prevented by the addition of IL-4 or IL-7, but not IL-2, IL-9, IL-13, or IL-15 (12). Similarly, treatment with IL-4 or IL-7 was shown to enhance the threshold for apoptosis induced by γ-irradiation in human peripheral blood T cells (13). Clearly these cytokines can mediate the survival of T cells in vitro; however, it has yet to be determined whether physiological levels of IL-4 or IL-7 play a role in mediating CD4 T cell survival in vivo. In this report, we examine the longevity of naive CD4 T cells and identify two factors that are important to the maintenance of the naive CD4 T cell pool in vivo. We show a reduction in the total CD4 T cell pool following adult thymectomy, with a selective loss of naive CD4 T cells. However, this does not result in the loss of all peripheral naive CD4 T cells, in that a population of long-lived naive CD4 T cells survives long after thymectomy. To identify the factors that contribute to the maintenance of long-lived naive CD4 T cells, we transferred naive CD4 T cells into hosts varying in their expression of MHC class II. As in earlier reports, we find that the signals delivered through MHC class II are important for the survival of naive CD4 T cells. We extend these findings by showing that CD4 T cells that are capable of being selected in the thymus by two different MHC alleles will survive in the presence of either. However, survival is optimal in the presence of MHC class II molecules which are capable of presenting Ag in the periphery (restricting MHC allele), even in a case in which the T cells were selected in a thymus with a different MHC class II allele (selecting allele). These findings also suggest that the peripheral survival of naive CD4 T cells parallels thymic positive selection, in that MHC class II molecules which select more efficiently also mediate peripheral survival optimally. We also find that physiological levels of either IL-4 or IL-7 can serve to further enhance the longevity of naive CD4 T cells in vivo, suggesting that there are multiple mechanisms contributing to the maintenance of the naive CD4 T cell pool. AND TCR-αβ transgenic (Tg)3 donor mice (TCR-specific for pigeon cytochrome c presented by I-Eb or I-Ek) were derived from a heterozygous mouse that was generously provided by J. Kaye (Scripps Institute, La Jolla, CA) (14). Subsequent generations of TCR Tg mice were maintained as heterozygotes on B10.A(5R) and C57BL/6 backgrounds. The AND TCR Tg mice were also crossed with IL-4−/− mice (15) (generously provided by W. Müller, University of Köln, Köln, Germany). These mice were back-crossed onto the B10.A(5R) background (for at least seven generations) and bred to homozygosity for the IL-4 null mutation before breeding with the AND TCR Tg mice. C57BL/6 mice were obtained from The Jackson Laboratory (Bar Harbor, ME). MHC class II−/− recipient mice were obtained from Taconic (Germantown, NY). CD4−/− mice (16) were maintained in animal facilities at Yale University. The 107-1 I-E Tg mice (obtained from R. Flavell, Yale University, New Haven, CT) (17), were derived on B10 mice and back-crossed onto C57BL/6 (for at least seven generations). Five- to six-week-old mice were anesthetized with a mixture of ketamine (Fort Dodge Laboratories, Fort Dodge, IA) and xylazine (Abbott Laboratories, North Chicago, IL) at 500 μg/25 g mouse for each anesthetic and kept under anesthesia using Metofane (Pitman-Moore, Mundelein, IL) just before surgery. A midline incision in the upper thoracic region exposed the sternum. A small incision of the sternum exposed the thymic lobes. The thymus was then removed by suction, and the wound was closed using surgical staples. Sham-thymectomized (STx) mice underwent the same procedure, with the exception that the thymus was left intact. Mice were kept warm with a heat lamp and observed after the surgery until they regained consciousness. Surgical staples were removed 1 wk later. Successful extraction of the thymus was verified upon sacrifice of the animals. The preparation of CD4 T cells from TCR Tg mice was as follows: Unless otherwise stated, mAbs used in cell preparations were purified from supernatants of hybridomas maintained in this laboratory using standard protein A or protein G affinity chromatography. CD4 T cells were isolated from the spleens and lymph nodes of donor animals by negative selection using mAbs against CD8 (clones 53-6.72 and 2.43) (American Type Culture Collection (ATCC), Manassas, VA), MHC class II I-A (clone 212.A1) (18), and FcR (clone 2.4-G2) (ATCC), followed by incubation with anti-mouse and anti-rat Ig-coated magnetic beads (Collaborative Research, Bedford, MA). Transfer was as follows: C57BL/6 and 107-1 recipients underwent surgical thymectomy at 5–6 wk of age, and were allowed to recover for ≥2 wk before being used in experiments. On the day of transfer, all recipient mice were sublethally irradiated (500 rad) and reconstituted within 6 h with 1.5 × 107 CD4 T cells obtained from AND TCR Tg mice on the C57BL/6 background. The following mAbs were used to stain cell surface molecules: FITC-labeled anti-Vα11 TCR (clone RR8-1) (PharMingen, San Diego, CA), biotin-labeled anti-CD45RB (clone 16A) (PharMingen), phycoerythrin-labeled anti-L-selectin (clone Mel-14) (PharMingen), and Quantum Red-labeled anti-CD4 (clone H129.19) (Sigma BioSciences, St. Louis, MO). Bound biotin-labeled Abs were detected with Texas Red avidin (Vector Laboratories, Burlingame, CA). RBCs were eliminated from spleen suspensions by centrifugation over lymphocyte separation medium (ICN Biomedicals, Aurora, OH) before staining. Cells were surface-stained in Abs diluted in staining buffer (PBS/5% FCS/0.01% sodium azide) containing 1 mg/ml mouse Ig for 30 min and subsequently washed twice in staining buffer. Biotinylated Abs were subsequently detected with Texas Red avidin diluted in staining buffer, for 10 min, then washed twice in staining buffer. Cells were fixed in 1% paraformaldehyde before analysis. Four-color analysis was performed on a FACStar system (Becton Dickinson, Mountain View, CA). FACS data were analyzed using LYSYS software and CellQuest software (Becton Dickinson). Single-cell suspensions of spleen and a pool of mesenteric, inguinal, axilary, and brachial lymph nodes were prepared for each animal. To exclude RBCs from spleen suspensions and exclude trypan blue from lymph node cell suspensions, spleen and lymph node suspensions were counted to determine the total number of cells using Turk’s solution and 0.01% gentian violet (Sigma) in 3% acetic acid. The total number of donor CD4 T cells for each organ was calculated from the frequency of donor CD4 T cells determined by flow cytometric analysis and the total number of cells from each organ. Mice were depleted of endogenous levels of IL-7 using a modification of a protocol described previously (19). Anti-human/mouse IL-7 (mouse IgG2b) (Genzyme, Cambridge, MA) was injected i.p. in doses of 200 μg/0.2 ml on day 0 (day of thymectomy) and on days 2, 4, and 6 after thymectomy of AND TCR Tg or IL-4−/− AND TCR Tg mice. Mice were sacrificed and analyzed for cell numbers on day 7. Other IL-4−/− AND TCR Tg mice were injected i.p. with a control mouse IgG2b anti-trinitrophenyl Ab (clone 49.2) (PharMingen) in doses of 200 μg/0.2 ml on the same days. IL-4 levels were determined using ELISA kits (Endogen, Woburn, MA). Assays were standardized with rIL-4 (Collaborative Research). IgE levels were determined by a sandwich ELISA in which the capture Ab was anti-mouse IgE (ε-chain) (The Binding Site, Birmingham, U.K.) and the detecting Ab was biotinylated monoclonal rat anti-mouse IgE (Biosource International, Camarillo, CA). The IgE ELISA was standardized with purified mouse anti-trinitrophenyl IgE (clone IgE-3) (PharMingen). Biotinylated Abs were bound to horseradish peroxidase-streptavidin (Zymed, South San Francisco, CA) in all assays, and the substrate for horseradish peroxidase was the trimethylbenzidine One-Step Substrate System (Dako, Carpinteria, CA). To study the longevity of naive CD4 T cells in vivo, AND TCR Tg mice whose TCR is specific for cytochrome c (14) were thymectomized at 5–6 wk of age; at various timepoints following thymectomy, the survival of the naive CD4 T cell pool was determined. Because thymectomy prevents the addition of new naive cells to the existing pool, and because the absence of specific Ag in the TCR Tg mice prevents entrance of CD4 T cells into the effector and memory pool, a fixed population of naive CD4 T cells is created. As seen in Fig. 1⇓A, left panel, there is a loss in the total number of CD4 T cells (total bars) when thymectomized (ATx) animals are compared with STx littermates at 4 wk postthymectomy. The reduction is seen primarily within the Tg+ CD4 T cell population (striped, top portion of bars), whereas the Tg− population (bottom, solid portion of bars) is unaffected. Because the TCR Tg+ CD4 T cells are primarily of the naive phenotype as determined by L-selectin and CD45RB expression (data not shown), this suggests that naive CD4 T cells are preferentially lost during the 4 wk following adult thymectomy. To test this, the same analysis was conducted to determine the survival of naive CD4 T cells after thymectomy, using phenotypic markers of naive and memory/effector CD T cells. It can be seen in Fig. 1⇓A, right panel, that there is a preferential loss of naive CD4 T cells (CD45RBhigh, L-selectinhigh), whereas the effector/memory pool (the remaining CD4 T cells) remains intact. To ensure that these results were not unique to this TCR Tg strain, the same analysis was performed using a second TCR Tg strain whose TCR is specific for a myelin basic protein peptide (20) and yielded similar results (data not shown). In addition, non-Tg littermates showed the same preferential loss of naive CD4 T cells after thymectomy (data not shown). Preferential loss of naive CD4 T cells following adult thymectomy. A, The number of total splenic CD4 T cells (total bars) in STx and ATx TCR Tg mice are compared at 4 wk postthymectomy. Left panel: The top, striped portion of bars represents Tg+ CD4 T cells; the bottom, solid portion of bars represents Tg− CD4 T cells. 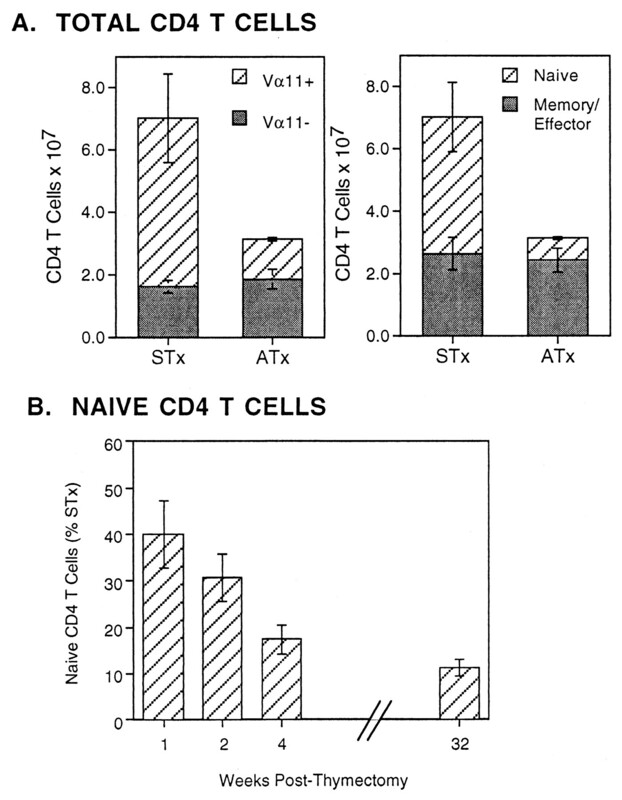 Right panel: The top, striped portion of bars represents naive CD4 T cells; the bottom, solid portion of bars represents memory/effector CD4 T cells. The error bars in both panels represent the SD for each subset of CD4 T cells. Results are from one representative experiment where n = 3 (STx) or 4 (ATx). B, The loss of splenic naive CD4 T cells in ATx TCR Tg mice is shown for several timepoints (n = 5, 6, or 7). The number is expressed as a percentage of the naive CD4 T cells found in their STx littermates at each timepoint. Bars represent the mean value for each group; error bars represent the SD. To determine how quickly reduction in naive CD4 T cells occurs following adult thymectomy, the number of naive CD4 T cells found in STx and ATx TCR Tg mice was compared at various timepoints (1, 2, 4, and 32 wk) after thymectomy (Fig. 1⇑B). The results were normalized between cohorts by expressing the number of naive CD4 T cells in ATx mice as a percentage of the naive CD4 T cells found in their STx littermates at each timepoint. As early as 1 wk postthymectomy, the number of naive CD4 T cells in ATx mice is only 40% of the number in the STx littermates and continues to drop through week 4 to ∼17%. However, this does not result in the eventual loss of all naive CD4 T cells. In fact, the percentage of naive CD4 T cells in ATx mice does not change significantly after the first month, demonstrating a long-lived population of naive CD4 T cells, as was shown previously (1, 2, 3, 4). Taken together, these data suggest that there is a stable population of naive CD4 T cells that is maintained over time, despite the fact that a great number of naive CD4 T cells are lost. Recent reports have placed great importance on the interactions of T cells with MHC molecules for T cell survival (6, 7, 8, 9, 10). For both CD4 (10) and CD8 (9) T cells, adoptive transfer studies have shown that MHC class II and MHC class I molecules, respectively, are required for the survival of naive T cells, and that the presence in the periphery of the selecting MHC molecule seen in the thymus is critical for survival. AND TCR Tg CD4 T cells recognize Ag in the context of MHC class II I-E (11, 14); however, these cells can also be selected on MHC class II I-Ab (11). We took advantage of this finding to ask whether the survival of Tg+ CD4 T cells in the periphery required the restricting class II I-E molecule or whether I-Ab could mediate survival as well, despite the fact that I-Ab is not capable of presenting the cytochrome c peptide to AND TCR Tg CD4 T cells (Ref. 11 ; S. Constant and K.B., unpublished observations). To investigate this issue, we transferred Tg+ CD4 T cells from I-Ab, I-E− C57BL/6 donor mice into recipients that differed in MHC class II expression. The recipients either 1) lacked MHC class II (class II−/−) (21); 2) expressed the selecting MHC class II I-Ab but not I-E (C57BL/6); or 3) expressed the selecting MHC class II I-Ab as well as a restricting MHC class II I-E (107-1). The 107-1 recipient is a C57BL/6 (I-Ab) mouse that carries an Eα transgene; this transgene allows the expression of MHC class II I-E, which is expressed, along with I-Ab, on all thymic epithelial cells, B cells, macrophages, and dendritic cells (17) at levels equivalent to wild-type MHC class II I-E-expressing mouse strains (22). C57BL/6 (I-E−) TCR Tg CD4 T cell donors were chosen to avoid transferring any contaminating donor populations of MHC class II I-E+ APCs to the recipients. Furthermore, Tg+ CD4 T cells derived from C57BL/6 mice are not alloreactive to the MHC class II I-E on 107-1-derived APCs in vitro (S. Constant and K.B., unpublished observations). The C57BL/6 and 107-1 recipients were thymectomized to eliminate homeostatic interference from a continual input of new host T cells, but were otherwise immunocompetent. All animals were irradiated, and each received 1.5 × 107 CD4 T cells from TCR Tg mice. Lymph nodes and spleens were harvested at 6 wk after adoptive transfer, and the survival of naive TCR Tg+ CD4 T cells was determined by flow cytometry. Recovered CD4 T cells were considered naive Tg+ CD4 T cells if they were Vα11+ and bearing two phenotypic markers for naive CD4 T cells, CD45RB and L-selectin. All of the naive CD4 T cells analyzed showed a resting, nonactivated phenotype as determined by forward and side light scatter. Fig. 2⇓A shows Vα11 expression of the naive CD4 T cells (CD4+, CD45RBhigh, L-selectinhigh) in the starting population of transferred cells; only those Vα11high naive cells within the gate were analyzed at 6 wk posttransfer. Most of the recovered naive CD4 T cells maintain expression of the transgene. As shown in Fig. 2⇓B, the C57BL/6 host (selecting MHC) sustains naive CD4 T cells more efficiently than a class II−/− host. However, the 107-1 host, which expresses I-E, the restricting MHC class II molecule, mediates the survival of naive CD4 T cells two to three times more efficiently than the host expressing only the selecting MHC class II, despite the fact that the CD4 T cells transferred into both recipients developed in the C57BL/6 (I-Ab, selecting) background. These results confirm that MHC class II expression is important for the survival of naive CD4 T cells. Moreover, there is a preferential survival of naive CD4 T cells when placed in the environment of restricting MHC molecules capable of presenting Ag, regardless of the MHC class II allele upon which they were selected. The restricting MHC class II molecule mediates survival of naive CD4 T cells more efficiently than other selecting MHC class II molecules. A, Expression of the Vα11 transgene is shown for the starting population of naive transferred cells and the gate established for the analysis of each group at 6 wk posttransfer. Histograms are gated on CD4+, CD45RBhigh, L-selectinhigh T cells. B, The total number of naive Tg+ CD4 T cells recovered from lymph nodes and spleens of adoptively transferred recipients at 6 wk posttransfer was determined by flow cytometry. Results are from one of three representative experiments (n = 3 per group). Bars represent the mean value for each group; error bars represent the SD. As illustrated in Fig. 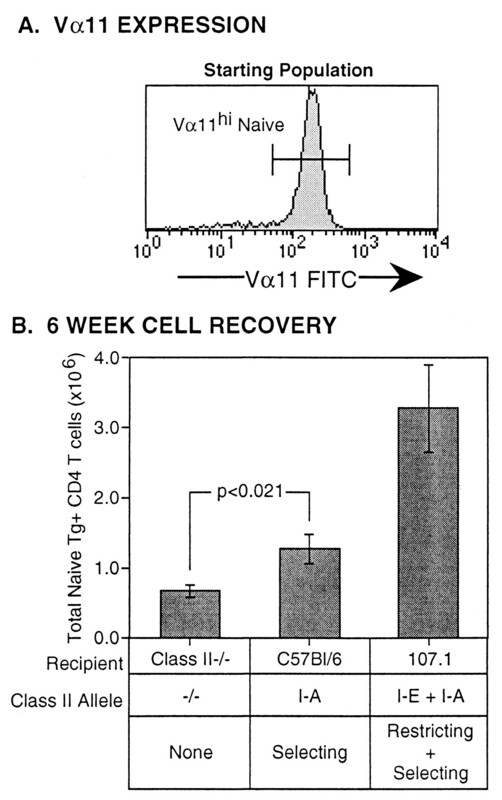 2⇑, naive CD4 T cells survived poorly in MHC class II-deficient mice. Because MHC class II-deficient mice are nearly devoid of peripheral CD4 T cells (21), it is possible that transferred CD4 T cells engrafted differently in MHC class II-deficient recipients compared with recipients that express MHC class II. To test whether engraftment potential played a role, TCR Tg CD4 T cells were transferred into CD4-deficient recipients (16). This recipient expresses the selecting MHC class II I-Ab, but develops no CD4 T cells, thus resembling the MHC class II-deficient phenotype. If MHC class II was the only factor necessary for CD4 T cell survival, we predicted that naive CD4 T cells would survive in these animals much as they did in the C57BL/6 recipient. As illustrated in Fig. 3⇓A, and much to our surprise, naive CD4 T cells survived much more efficiently in C57BL/6 CD4−/− recipients, showing a 13-fold augmentation over survival in C57BL/6 and a 5-fold augmentation over survival in 107-1 mice. These data suggested that there was an additional factor present in CD4−/− mice that was greatly enhancing the survival of naive CD4 T cells. Other factors may be involved in survival of naive CD4 T cells. A, The total number of naive Tg+ CD4 T cells recovered from lymph nodes and spleens of adoptively transferred recipients at 6 wk posttransfer was determined by flow cytometry. Results are from one of two representative experiments (n = 3 per group). Note that the numbers for C57BL/6 and 107-1 recipients are the same as those in Fig. 2⇑, but the scale has changed to accommodate the CD4−/− recipients. Bars represent the mean value for each group; error bars represent the SD. B, Total serum IgE was determined for all four groups of recipients by ELISA. •, Serum IgE for one animal; a short, solid line represents the mean for the group. Because IL-4 has been shown to rescue CD4 T cells from apoptosis in vitro (12, 13), we considered IL-4 to be a candidate cytokine that may be present in high enough quantities in the periphery of CD4−/− mice to enhance the survival of naive CD4 T cells that we observed. To explore this possibility, blood serum samples were collected from all four recipient types and tested directly for the presence of IL-4 or indirectly by measuring levels of IgE, as it is known that IL-4 drives class switching to IgE (23, 24). Although we were unable to detect IL-4 directly in any of the serum samples (data not shown), Fig. 3⇑B shows that CD4−/− mice have elevated IgE levels compared with C57BL/6 and 107-1 mice, suggesting the presence of IL-4 in levels sufficient to induce class switching to IgE. Interestingly, the MHC class II−/− mice also exhibited elevated levels of IgE, yet were poor mediators of survival of naive CD4 T cells. These results suggest that IL-4 or other factors may play a role in enhancing the MHC class II-mediated survival of naive CD4 T cells. If IL-4 or other cytokines are important to the survival of naive CD4 T cells in vivo, the absence of these cytokines would reduce the number of surviving naive CD4 T cells in the periphery. We wished to assess the roles of IL-4 and also of IL-7, because it was the only other cytokine found to mediate survival of CD4 T cells in vitro (12, 13). To do this, we thymectomized TCR Tg IL-4−/− mice (15) and compared the survival of naive CD4 T cells with thymectomized IL-4+/+ AND TCR Tg mice. Overall thymic cellularity as well as CD4/CD8 ratios and numbers of CD4 T cells in the periphery are comparable between these two strains of mice (data not shown); therefore, it is feasible to compare the two strains postthymectomy. It was not possible to use IL-7- or IL-7R-deficient mice in our thymectomy studies, because T cell development in these mice is severely impaired (25, 26, 27). Therefore, for IL-7 removal, we treated wild-type or IL-4-deficient ATx TCR Tg mice with anti-IL-7 Abs that had been shown previously to neutralize IL-7-induced tumor cell activities in mice (19). We analyzed survival at 1 wk postthymectomy, a time at which significant numbers of naive CD4 T cells are still present. As shown in Fig. 4⇓A, left panel, depletion of either IL-4 or IL-7 alone had no effect on the number of naive CD4 T cells found in ATx mice at 1 wk postthymectomy compared with untreated, IL-4+/+ ATx mice. However, IL-4−/− mice that also received anti-IL-7 Ab treatment showed an approximate twofold reduction in the number of naive CD4 T cells. A one-way ANOVA shows a significant effect arising from differences between the anti-IL-7-treated IL-4−/− mice and the other three groups (p = 0.015). In a separate experiment (Fig. 4⇓A, right panel), an injection of isotype-matched control mouse IgG2b Abs had no effect on the naive CD4 T cell pool in IL-4−/− mice when compared with untreated IL-4−/− mice, whereas a lack of both IL-4 and IL-7 in the periphery leads to a reduction in the number of naive CD4 T cells when compared with both untreated IL-4−/− mice and isotype control-treated mice (p = 0.032). It is important to point out that these events are taking place in a periphery that expresses the restricting MHC class II allele I-E, suggesting that IL-4 and IL-7 serve to enhance the MHC class II-mediated survival of naive CD4 T cells. Deprivation of both IL-4 and IL-7 results in further loss of naive CD4 T cells following thymectomy. The number of splenic naive or memory/effector CD4 T cells was determined at 1 wk after adult thymectomy of TCR Tg mice. A, Left panel: The number of surviving naive CD4 T cells (CD4+, CD45RBhigh, L-selectinhigh) is compared in IL-4+/+ mice that were treated or untreated with anti-IL-7 and in IL-4−/− mice that were treated or untreated with anti-IL-7 (n = 2 for untreated groups and n = 3 for anti-IL-7-treated groups). Right panel: Number of surviving naive CD4 T cells is compared in IL-4−/− mice that were either untreated (n = 2) or treated with an isotype-matched control Ab (n = 2) or anti-IL-7 (n = 3). B, The number of memory/effector CD4 T cells was compared among groups in experiment 1. Bars represent the mean value for each group; error bars represent the SD. ∗, Post hoc Bonferroni/Dunn: p = 0.015 for experiment 1, p = 0.032 for experiment 2. We also asked whether deprivation of IL-4 and/or IL-7 had an effect on the size of the memory/effector CD4 T cell pool. As seen in Fig. 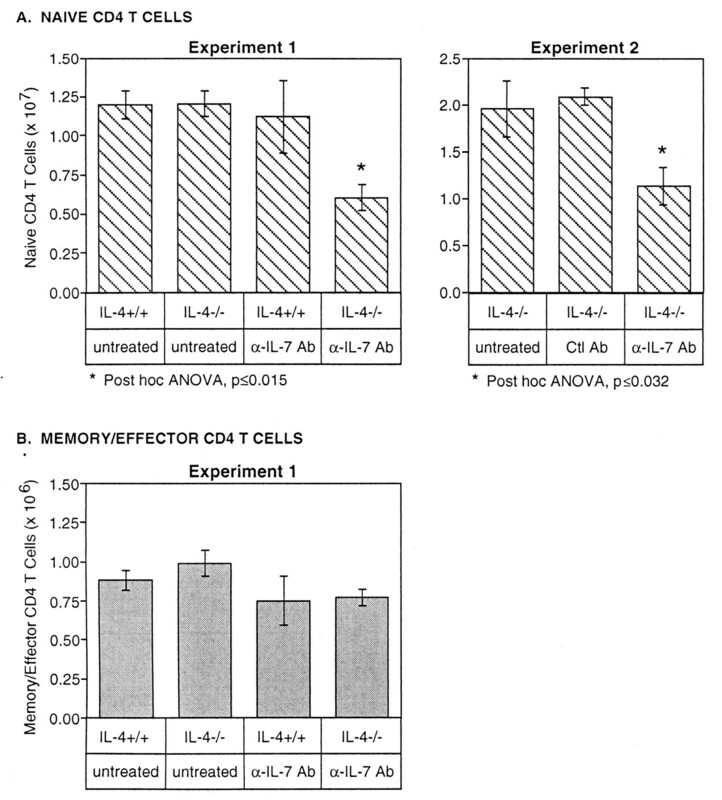 4⇑B, and confirmed by one-way ANOVA, there is no effect of anti-IL-7 treatment and/or IL-4 deficiency on the memory/effector CD4 T cell pool. Taken together, these data indicate that the presence of physiological levels of either IL-4 or IL-7 is sufficient to enhance the survival of naive CD4 T cells in the presence of MHC class II molecules. Depletion of one can be compensated by the other, but removal of both leads to partial loss of naive CD4 T cells. We have shown that there are two populations of naive CD4 T cells in the periphery: a stable, long-lived population as well as a short-lived population. We have identified two elements that contribute to the maintenance of long-lived naive CD4 T cells. The first is MHC class II. It has been shown that MHC class II molecules that select CD4 T cells are necessary for the survival of naive CD4 T cells. We extend these findings by showing that there can be more than one MHC class II molecule that will mediate the peripheral survival of naive CD4 T cells; however, MHC class II molecules that are capable of presenting the cognate Ag are more efficient mediators of survival than those that can only mediate positive selection but cannot present foreign peptide Ag to a given T cell. The second component contributing to longevity is the presence of physiological levels of IL-4 or IL-7 in vivo. Removal of either one of these cytokines has no effect on the naive CD4 T cell pool, whereas removal of both results in the reduction of the naive, but not memory, CD4 T cell pool, even in the presence of MHC class II molecules. Thymectomy of TCR Tg mice showed that many naive CD4 T cells are lost following adult thymectomy; however, a stable population of long-lived naive CD4 T cells is established within the first 4 wk after thymectomy. These data are supported by previous studies in ATx TCR Tg mice in which the naive CD4 T cells remaining after thymectomy were shown to be in interphase, indicating long-lived CD4 T cells (3, 28). However, in pulse-chase 5-bromodeoxyuridine labeling studies, the loss of naive CD4 T cells that was evident early in our thymectomy studies was not observed. This can be explained by the fact that their analysis of the cells began at 4 wk postthymectomy, by which time a stable population has been achieved. Our data also reconcile the conflicts between the 5-bromodeoxyuridine labeling studies, which concluded that CD4 T cells are long-lived (1, 2, 3, 4), and other studies, which suggested without quantitative determinations that naive CD4 T cells were short-lived (5). In exploring factors that contribute to the longevity of naive CD4 T cells, we have confirmed that the presence of MHC class II molecules is important to the maintenance of the naive CD4 T cell pool. In previous studies, it was shown that TCR Tg CD4 T cells will disappear following adoptive transfer into recipients lacking the MHC haplotype, which supports positive selection of these T cells (10). In our studies of transfer into MHC class II−/− hosts, we did not observe a complete disappearance of the TCR Tg naive CD4 T cells, although the analysis was conducted within the same time frame. There are several possible explanations for this discrepancy. The first and simplest explanation is that we transferred a much larger number of CD4 T cells into our recipients that perhaps would have subsequently disappeared completely. The second is that our recipients, although devoid of MHC class II molecules and thus CD4 T cells, were otherwise immunocompetent. This may provide a more supportive environment for persistence compared with the immunodeficient hosts used in the previous study. As was shown in Fig. 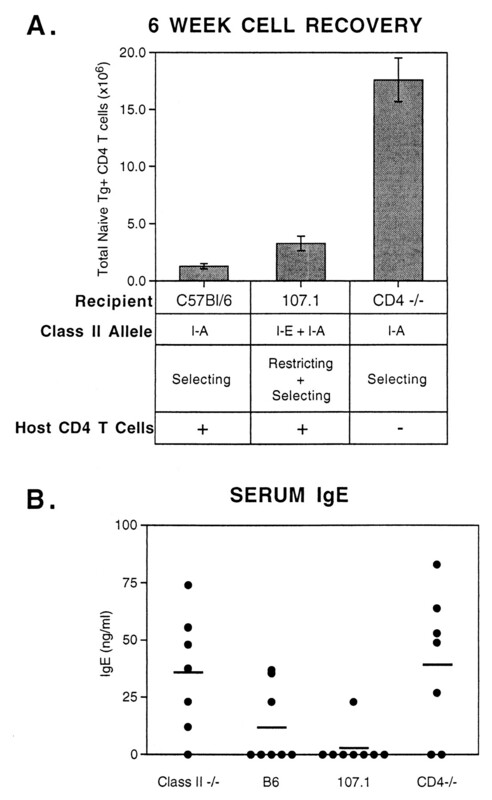 3⇑B, the MHC class II−/− recipients showed high levels of serum IgE, indicating the presence of IL-4, which may have served to promote survival to a small degree in an immunocompetent host, even in the absence of MHC class II. A third possibility is that naive CD4 T cells may disappear more rapidly in the presence of a nonselecting MHC molecule compared with a lack of MHC altogether; however, for CD8 T cells this has not been shown to be the case (9). With regard to the presence of IgE in the CD4−/− and MHC class II−/− mice, we believe that the class switch was driven by the presence of IL-4. However, CD4−/− mice have been shown to be defective in Th2 responses, and thus in IL-4 production (29, 30, 31). It is possible that there are other sources of IL-4 production in these mice that arise from responses that do not require TCR/CD4/MHC class II interactions. One possible source is γδ T cells. A recent report shows that γδ T cell clones as well as primary γδ T cells are capable of IL-4 production (32). Alternatively, NK1 T cells, a specialized subset of αβ T cells that recognize the conserved MHC class I-like CD1 molecule, are capable of releasing IL-4 within minutes of activation (reviewed in 33). In mice that overexpress NK1 T cells, there is increased production of IL-4 and IgE (34). It is possible that in mice which lack CD4 T cells and are thus somewhat immunocompromised, there is a dysregulation of these other cell types driven by the need to respond to environmental Ags, resulting in augmented IL-4 production. Also of note in the CD4−/− recipients is the recovery of a greater number of naive CD4 T cells than was originally transferred into these hosts. Such slight expansions in similar systems has been shown previously (35). Given the results in Fig. 4⇑, it is possible that this larger recovery may be due to the excess of IL-4 shown to be present in the CD4−/− recipients. There may also be an excess of IL-7 in these mice which is unknown at this time. Additional experiments will address these issues directly. To extend earlier findings regarding MHC and the onward survival of naive T cells, we find that there is a preference in the periphery for an MHC class II molecule that is capable of presenting the foreign Ag to the TCR in question, regardless of which MHC class II molecule mediated positive selection in the thymus. It could be argued that the recipients that expressed both MHC class II I-A and I-E molecules have a more dense expression of MHC class II on the cell surface than the recipients that only expressed the selecting I-A molecule; hence, the former would mediate the survival of naive CD4 T cells more efficiently due to quantity of signal rather than quality. However, using an Ab that recognizes both MHC class II I-A and I-E, we find that this is not the case, and that total MHC class II density on the cell surface is equivalent between these two strains of mice (data not shown). In addition, although it is known that TCR Tg T cells from AND mice cannot respond to cytochrome c peptide in conjunction with I-Ab, it is unknown whether they can respond to other foreign peptides presented by I-Ab, which could potentially skew our results or our interpretations. However, we feel that this possibility is highly unlikely. If AND TCR Tg T cells could respond to I-Ab plus foreign peptides, we would find more Tg+ CD4 T cells in an adoptive I-Ab host, from proliferation in response to environmental Ags, than in I-Ek hosts, but this is not the case. In addition, AND TCR Tg mice themselves on the I-Ab background would contain a significant number of Tg+ cells bearing the memory phenotype if response to foreign peptides were possible, but this is also not the case. We would argue that the I-E MHC class II molecule mediates survival better than I-A because it makes a more productive interaction with the AND TCR than the I-A MHC class II molecule. In the thymus, although MHC class II I-A can positively select the AND TCR, I-E mediates positive selection a good deal more efficiently (11). Therefore, our findings indicate that survival in the periphery closely parallels positive selection in the thymus. This possibility has been introduced elsewhere (36), along with an analysis of the role for self-peptide/self-MHC complexes in this process. It appears that MHC class II molecules are not the only players that support the peripheral survival of naive CD4 T cells. Our data support a role for the cytokines IL-4 and IL-7 in the survival of naive CD4 T cells in vivo. Although it was clear in in vitro studies that excess amounts of IL-4 or IL-7 could prevent apoptosis in T cells, it was unclear whether physiological levels of IL-4 or IL-7 were required for the optimal survival of CD4 T cells in vivo. For naive CD4 T cells, it appears that these two cytokines play a role in maintaining the naive CD4 T cell pool in vivo, whereas the memory/effector pool remains intact in their absence. However, it is possible that a loss occurs in this population as well, but is subsequently replaced by expansion of the remaining memory CD4 T cells, as it is well documented that memory T cells have a great capacity for peripheral expansion compared with naive T cells (35, 37, 38, 39, 40). Although IL-4 and IL-7 enhance the survival of naive CD4 T cells in vivo, our data suggest that the presence of MHC class II has a greater impact on this process, and that these cytokines serve to augment the MHC class II-mediated survival of naive CD4 T cells. We make this argument based on the fact that MHC class II-deficient recipients and MHC class II+ CD4-deficient recipients both have elevated levels of IgE, indicating the presence of IL-4. When the survival of naive CD4 T cells in such mice is compared with C57BL/6 and 107-1 recipients, the MHC class II-deficient recipients are the poorest mediators of survival of naive CD4 T cells; the MHC class II+ CD4 deficient recipients are the most efficient mediators. Taken together, these data indicate that the CD4 T cells emerging from the thymus have the potential for long life, provided they make productive interactions with MHC class II molecules, with some interactions being more productive than others. This process appears to parallel positive selection in the thymus. In addition, the cytokines IL-4, IL-7, and perhaps other as yet unknown factors can augment the MHC class II-mediated survival of naive CD4 T cells. We thank P. Ranney for technical assistance in maintaining the mouse colony, T. Taylor for technical assistance in flow cytometry, H. MacLeod for technical assistance with IgE ELISAs, G. Williams for advice on statistical analysis, and C. A. Janeway Jr. and D. Sant’Angelo for critical reading of the manuscript. ↵1 This work was supported by National Institutes of Health Grant CA38350 and the Howard Hughes Medical Institute. T.E.B. was supported by a National Science Foundation Predoctoral Fellowship. ↵2 Address correspondence and reprint requests to Dr. Kim Bottomly, Section of Immunobiology, Yale University School of Medicine, and Howard Hughes Medical Institute, 310 Cedar Street, New Haven, CT 06520-8011. ↵3 Abbreviations used in this paper: Tg, transgenic; STx, sham-thymectomized; ATx, adult-thymectomized.